nesdev.com • View topic - Z80 T-cycle timing: what the hell damn guy? 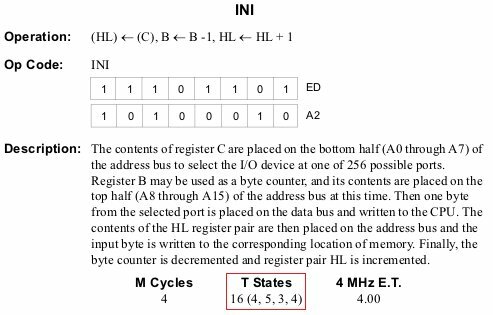 Z80 T-cycle timing: what the hell damn guy? Post subject: Z80 T-cycle timing: what the hell damn guy? The opcode fetch (0xed) should consume 4 cycles. The suffix fetch (0xb0) should consume 4 cycles. The read from (HL) should consume 3 cycles. Incrementing HL and DE; plus decrementing BC; should take 3 cycles? Yet we end up consuming 5. Decrementing PC when BC=0 should take 1 cycle? But ends up consuming 5. The opcode fetch (0xed) is once again 4 cycles. But now the suffix fetch (0xa2) is taking FIVE cycles??!! The increment of HL and decrement of B should take 2 cycles, but instead takes four. Post subject: Re: Z80 T-cycle timing: what the hell damn guy? It's microcoded, right? So those extra cycles are taken up by some hidden opcode sequencer figuring out what instruction to do next to perform LDIR, I'd imagine. Probably. I know the 68K definitely is, at least. The issue is I'm really not sure how to emulate such variable timings. Maybe I could make a template parameter on the read/write/in/out functions to override the amount of cycles they consume. Sometimes add one, sometimes remove one. But when there are extra M cycles (presumably wait states), it's important to know where to place them to get a proper cycle timing between components. There's also so many mistakes in the manual. I'd hate to go to the extra trouble and end up with broken timings for it. You end up using unrolled LDIs because it's faster than LDIR. HL, BC, DE registers are 16 bits so that requires using 16 bits inc/dec ALU, not sure how many are available in the Z80 CPU but that may explain why the LDI instruction is so slow. You can look at the bus traces I linked a while back to see what's going on. Remember, internal operations (i.e. T-states in excess of what that type of bus access should normally take) occur at the end of an M-cycle. The fourth M-cycle is the write to (DE) (#012-#014) plus two internal T-states (#015-#016). The Z80 has to increment DE, decrement BC, and test the decremented BC for zero. Fetch, fetch + one internal operation (#009), port in, write. I believe the Z80 has only one 16-bit inc/dec unit which is shared between the PC, the SP, and the register pairs, and it takes more than one T-state to do its job (i.e. increment or decrement one 16-bit register). Any M-cycle that performs an increment/decrement that the next cycle needs the value of seems to end up taking extra T-states. Notice that PUSH qq has an internal T-state after the fetch and before the first memory write (5, 3, 3) but POP qq doesn't have any (4, 3, 3). PUSH needs the decremented value of SP, so the second M-cycle can't begin until the decrement is complete. But for POP the effective address is the current value of SP, so the memory access can happen right away. Don't think of each T-state as one discrete operation (this cycle is incrementing HL, this next one is incrementing DE), think of several things going on at once inside the chip that take varying amounts of time, and the next M-cycle can't begin until all of them are done. Internal T-states happen when the register-level operations can't all be completed in the time that the memory operation takes. From an emulation perspective I suggest having a "op_internal(unsigned count)" method that can efficiently add any number of internal T-states, and call that from each opcode handler at the appropriate times (just like you call op_io() or whatever it's called now in the 65816/6502) You pretty much have to handle the internal cycles separately from the memory-accessing cycles, because some (many) instructions have an internal T-state or two on their first cycle, and you can't tell that until you've decoded the instruction! Would you happen to have a bus trace for every instruction? That would be really super helpful. Oh, whew. I can accept that the increment wait-state is earlier in the instruction this time, but not that a read/write/in/out call takes less time. Yeah, right now I have: read, write, in, out, wait. And I also have some convenience wrappers like opcode() [8-bit read from PC + one wait state], operand() [8-bit read from PC], operands() [16-bit read from PC], push, pop, etc that are all built off the first five. The downside is those internal operations consume time, so it becomes harder to count the T-states to make sure there are no errors. But it's not impossibly difficult. 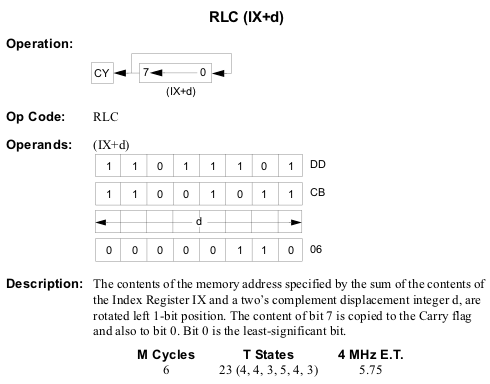 > You pretty much have to handle the internal cycles separately from the memory-accessing cycles, because some (many) instructions have an internal T-state or two on their first cycle, and you can't tell that until you've decoded the instruction! Given that internally, all read/write/in/out/wait calls advance the CPU time, and can thus cause a context switch, it may be a good micro-optimization to have something like read<5>(addr) instead of read(addr), wait(2). But the cycle timing could end up wrong if the wait(2) isn't in the correct location. I don't know if all T-states do the bus operation at the start, and the I/O stuff at the end or not. Probably not a good idea to micro-optimize. The Z80 shouldn't be a bottleneck in the Mega Drive nor Master System. EDIT: I assume OUTI, OUTD are correct at 4,5,3,4 then. Since it's read+out at the end. Okay, implemented every instruction on the Z80. Have a few more questions, of course. I understand that RETI is a specialized version of RET that somehow signals to external hardware that it occurred. For the sake of the Master System and/or Mega Drive, do I need to do any kind of special handling for this, or can I just treat it like RET? And on that note, RETN is just RET + IFF1=IFF2, right? 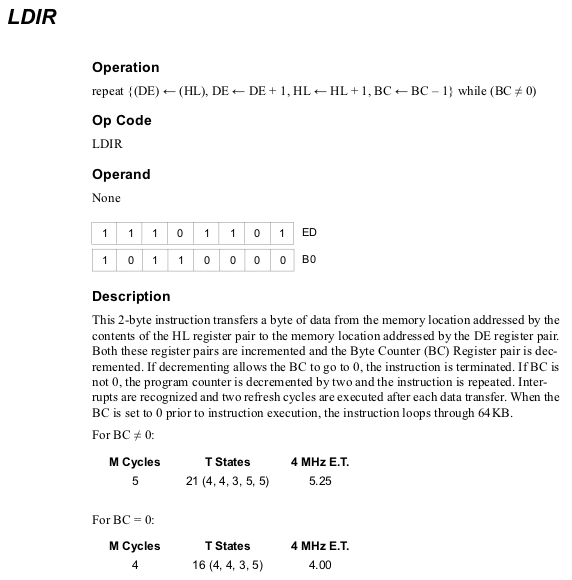 Are these instructions NOP (as per z80-documented.pdf), or LD I,I and LD R,R (as per http://www.z80.info/z80oplist.txt) ? This matters as there's (presumably) an extra cycle penalty on the latter. The manual states the T-cycles for these are T(4,5). I really would have expected this one to be T(4,4). Is there really an extra cycle here? Also, the manual says that "LD A,I"; "LD A,R"; set flags. I could understand that adding an extra cycle penalty. But "LD I,A"; "LD R,A" do not set flags and still (supposedly) have the extra cycle penalty? Wasn't able to use my LR35902 implementation (known to be correct per blargg), because it's missing a lot of the flag values and said CPU doesn't have the N flag that affects the computation. So my implementation was based off CZ80 ... is this algorithm known to be correct or incorrect? If that works, it's a very clever way to implement it. But it's highly unusual looking to me. I'd rather be a bit lazy and reuse the existing 8-bit ADD/SUB functions if possible. 99% sure this is fine, but just to be certain, it's okay if I implement these like so, correct? Last question, are there any good stress-testing modules for a Z80 core that don't require a working Master System VDP core? If I have to go my usual route (compare my trace logs to Mednafen's), I can do that, but I'd rather save time on the inevitable weeks of debugging a new CPU core. same as for byte 1. Unrolled 8 times. Wow, the card reads nybbles into RAM, with the top four bits unused in each byte? It actually would've been a pretty amazing opcode for serial if it were (hl)=(hl)<<1|a&1 instead. RRD as well in case the bits were in the other order. They both do IFF1 = IFF2 while RET doesn't. To be honest i don't even remember from where i get that implementation, i guess it was by reading and analyzing what was doing the DAA instruction or maybe from the small z80-documented.pdf file. The reason i used that code was to reduce code size, I mainly wrote CZ80 to provide a fast and (hopefully :p) accurate Z80 C core that i could use on Dreamcast (where code size matter a lot for better cache use). The reason moves to/from I incur the stall (and not just moves to/from R) is that internally IR is a single 16-bit register, with I in the upper half and R in the lower half. DAA is different between the LR35902 and the Z80 even apart from the Z80's additional flags. One difference (not the only one) is that on the LR35902 the upper and lower nybbles of A only affect the result of an adjust-after-add (NF == 0), but on the Z80 they affect both adjust-after-add and adjust-after-subtract. In fact, I believe the problem with the table VBA used was that it was correct for the Z80 rather than the LR35902. Just like the LR35902 SWAP instruction, they're useful for working with nybble-sized data (e.g. BCD decimal numbers). Okay, I think this is the most evil one yet. That's seven cycles, not six. Every instance ever of (IX,IY)+displacement consumes the two 3,5 T states. It looks like the documentation is acting as though you can read the opcode identifier at the same time as doing the wait(5) computation for (IX,IY)+displacement. Or is the documentation wrong here? Note that for the double-prefixed instructions, the bus signals and timing for the sub-opcode fetch cycle are the same as an operand fetch with two dead T-states after, not an opcode fetch (unlike CB-prefix-only instructions, where the sub-opcode fetch is a real opcode fetch) That also means that the R register isn't incremented for the sub-opcode. > That's why instructions with both a DD/FD prefix and a CB prefix are encoded "out of order", with the displacement coming before the sub-opcode. Oh man, thank you so much for explaining that. I was really racking my brain trying to understand why they went with that design. It completely wrecked my attempts to merge the DD/FD prefixes into the existing opcode tables. I ended up needing an entirely separate DD/FD CB instruction table, and as such had to do the displacement before invoking the individual opcodes due to needing the CB opcode number before I could invoke the appropriate instruction. I'll probably end up doing the same for the regular non-CB/ED instructions since why not at this point? Avoids the messy specialization for (IX,IY+n) conversion that's not needed for regular HL instructions. > That also means that the R register isn't incremented for the sub-opcode. If you don't mind, I do actually have one more interesting question. Turns out the source of a LOT of game bugs was that I was following the Z80 documented undocumented document where it was saying that DD/FD are treated as "separate instructions that set an internal flag", hence you can easily stack multiple prefixes like DD DD FD DD FD CB ... and it'll "ignore" all but the final FD. But if I do this, and allow interrupts to fire between the prefix and CB opcode, obviously very bad things happen. So ... what happens in a sequence like the above? What if I fill the bus with nothing but 0xDD? (All ROM and all RAM.) Will IRQs and NMIs never fire as a result?